BPA free, lead free, mercury free, phthalate free! Lunch Punch Match & MunchTM - 4 interactive puzzle shapes. For medium size bread. SIZE on each sandwich cutter is approximately 3.5 inc x 3.5 inc x 1.2 inc. Box dimension is 4.75 inc x 3.5 inc x 3.5 inc.</P>Lunch Punch Critter CuttersTM - 4 unique animal shapes. For Large size bread. SIZE on each sandwich cutter is approximately 3.75 inc x 4 inc x 1.2 inc. Box dimension is 4.75 inc x 3.75 inc x 4 inc.</P>Lunch Punch Vrrrrmm! !TM - 4 unique transport shapes. For Large size bread. SIZE on each sandwich cutter is approximately 3.75 inc x 4 inc x 1.2 inc. Box dimension is 4.75 inc x 3.75 inc x 4 inc. </P>Lunch Punch Sand*wishes*TM - 4 unique whimsical shapes. For Large size bread. SIZE on each sandwich cutter is approximately 3.75 inc x 4 inc x 1.2 inc. Box dimension is 4.75 inc x 3.75 inc x 4 inc. </P>Great for sandwiches, fairybread, toast, cakes, cookies, egg-in-the-hole and more! The Lunch Punch® is a food cutter specifically designed to capture the most amount of bread when it cuts the crust off your sandwich. A fun lunch with minimum waste. The Lunch Punch® is taller than cookie cutters, making it easy to cut through two pieces of bread and spread while still keeping sandwiches light and fluffy. Plus, The Lunch Punch® is kid friendly and dishwasher safe. The Lunch Punch® was invented by a mother of 3 young children to make lunch more fun for everyone. As every parent knows, it's a daily challenge to make a healthy and appealing lunch that kids will eat. Sandwiches are a mainstay in children's diets, but they're so boring and kids don't like the crust. 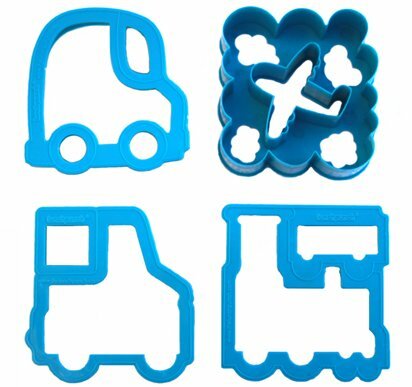 The Lunch Punch® cuts sandwiches into fun and interactive shapes while cutting off the crusts. The Lunch Punch® is designed to capture the most amount of bread to minimize waste. It's also tall and gentle on little helping hands.